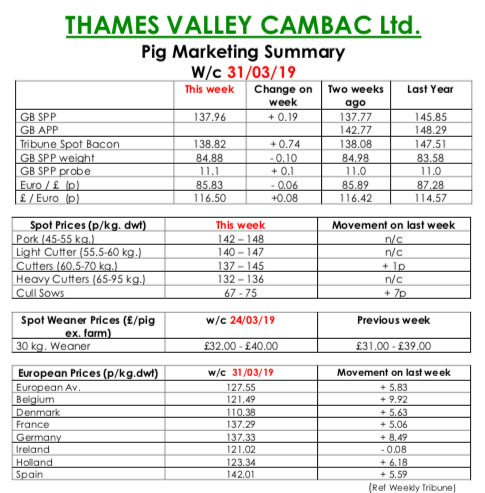 This week’s Pig Marketing Summary, from Thames Valley Cambac, reported that a relatively trouble free week was welcomed by both processors and producers. Some of the majors put plans in place to increase throughputs this week, but contract price contributions were stubbornly stand on. One of the reasons driving this increased kill was the potential export opportunity offered by the ASF situation in China. Reports suggest that cold store product that was stockpiled in advance of Brexit is now being loaded for shipping to the Far East. Meanwhile, supply remains steady at best, with many producers warning of lower numbers in the near future. The fresh meat market showed odd signs of improvement, probably due to less competition from imports. The cull sow market roared ahead again, up another 7p on the back of improved continental trade – that is 17p up in four weeks, and there is an old adage that says where sows go, pig price follows. European markets surged ahead again driven by export demand to China. The influential German market was up 10 euro cents, Belgium up just shy of 12, and most other quotes up 7. Prices in sterling were tempered slightly by small drop in the Euro that ended the week down 0.06p at 85.83p. The Weaner Marketing Summary, for week commencing March 24, reported that demand was a touch better this week, and prices improved as a result. Supplies of 7kg weaners are still relatively stable, but there is a significant shortage of 30kg stores. The prices announced by the AHDB saw no quote announced for a 30kgs store pig, and the weighted average for a 7kg weaner fall by 10p to £35.45.